Quite unusual, this sauce was served on a Fruit Plate at the Nut Tree Ranch’s restaurant in California many years ago. It could be ordered with cottage cheese, sherbet or ice cream making it either a salad or a dessert. The gift shop sold recipe cards as a souvenir which is how I came upon the recipe. I replaced the mayonnaise in the marshmallow sauce with sour cream to make it more of a dessert sauce. 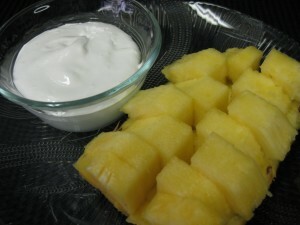 We often serve the marshmallow sauce as a dip for pineapple. To cut the pineapple the way it is in the picture, cut the top and bottom off the pineapple. Cut the pineapple lengthwise in quarters. Run a paring knife under the flesh to detach it from the skin leaving it on the skin. 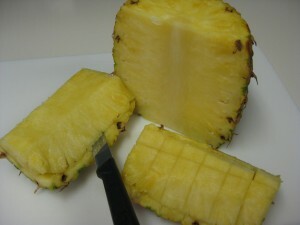 Cut the pineapple lengthwise into 2 or 3 strips then crosswise into bite-sized pieces. You can slightly push out every other piece for an interesting look. The other fruits it was served with included strawberries, figs, and grapes. It’s always a topic of conversation the first time someone has this. Kids will love it. Combine sugar, corn syrup, and hot water. Heat, stirring until sugar dissolves. Then boil without stirring to firm ball stage (245 – 250F – I like it done up to 255 F for a thicker sauce) – until a drop of the mixture forms a firm but malleable ball in ice water. If not using a thermometer, start testing after about 5 minutes. May take up to 10 minutes. This recipe is a bit forgiving – cook it longer rather than not enough. In humid weather, cook to higher temperature. With electric mixer, beat egg whites until stiff. Slowly add hot syrup in a thin stream, beating at high speed until thick and fluffy. Add vanilla and salt. Gently fold in sour cream and rind. If too thick add a bit more sour cream or try beating it a little after adding the sour cream which causes the sauce to thin quite a bit.